Cyberpunk 2020: Listen Up, You Primitive Screwheads!!!! A somewhat irreverant look at how to run a game. Publisher's blurb: "Listen Up You Primitive Screwheads!!!! 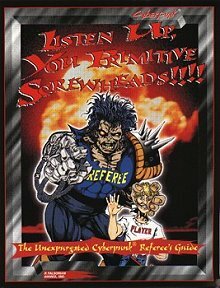 is subtitled The Unexpurgated CyberPunk Referee's Guide. We grabbed six of Cyberpunk's best (and most opinionated) Referees, writers, and players, as well as the creator himself, by the scruffs of their necks and made them tell us what to do:"